Bottled water is a must for summer. When dehydrated, you don’t perform at your peak or recover as quickly, whether from a trip to the gym or a night out partying. A lot of people tote their own BPA-free sport bottle, but when you’re away from home or the office, filling it up with filtered water generally means caving and buying a bottle of water, defeating the purpose of carrying a bottle from home in the first place. Water is an even higher priority when hiking or camping: There’s no Safeway in the back country, and in situations like that the Naked Filter is a perfect alternative to traditional purification methods. Designed by Liquidity Nanotech, an international group of scientists and researchers dedicated to bringing clean drinking water to the world, the Naked filter removes bacteria, cysts, and protozoa via a nanofiber mesh. The mesh itself is “electro-spun,” made of a polymer pulled into a nanometer-scale fiber using an electrical field. The resulting mat filters 99.9999 percent of bacteria and cysts, not to mention chlorine. Naked doesn’t get rid of everything, but it filters out the things that can make you really sick in addition to sand and sediment, which is more than you can say for your Brita. The filter is available for industrial applications — in fact, Liquidity is advertising for NGOs that can help make the dream of safe water for the world a reality. The design of the filter may lessen the cost of producing clean water on a large scale because it can work via gravity alone, as opposed to other filter types. As the company explains, the product doesn’t require the high water pressure otherwise needed to force liquid through a tighter filter, as do filtration systems like the one in your fridge or attached to the faucet. This could mean the introduction of a new water pitcher to make that old Brita even more obsolete, but for now average Joes and Janes can pick up Liquidity’s bottle top filter. The bottle top has threads that screw in to most sports bottles. Replacing the standard bottle with the Naked Filter bottle and filter — or just replacing the top — erases the need to buy that bottle of water during the day, and forget carrying purification tablets or boiling water when adventuring. As the filter loses efficacy, it simply stops flowing until no water passes through, so you’ll know when you have to return to traditional methods or buy another filter. The Naked Filter’s Kickstarter campaign is still running, and though it’s already fully funded they have some worthy stretch goals. 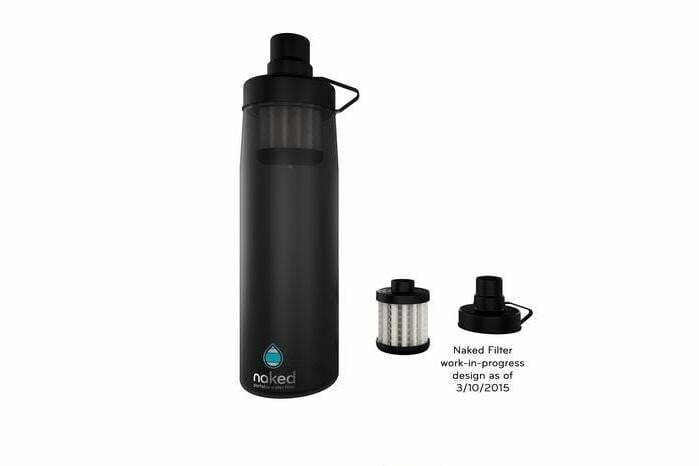 $14 will get you a bottle and filter, saving you $10 over the retail price. If you’re part of a couple, $46 will get 2 bottles and 6 filter so you and your better half will be prepared. $100 gets you a bottle autographed by the Liquidity Nanotech geniuses, in addition to a second bottle and filter that you can use while the signature edition sits proudly on your mantle. The Kickstarter campaign ends on April 23, so get while the getting is good. Save the landfill from yet another empty plastic bottle, and save yourself some money by not buying bottled again.